An experienced electrician was fatally injured while changing fluorescent light fixtures. A series of light fixtures were being moved as part of a building renovation. 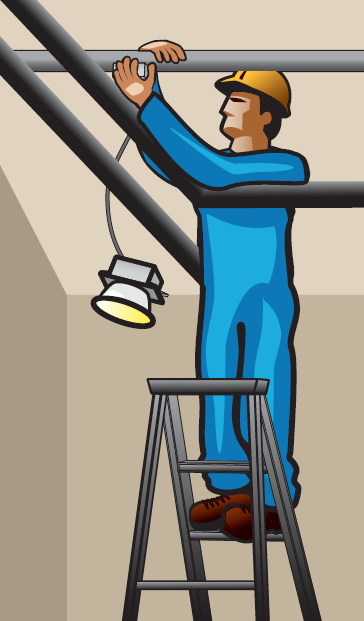 The electrician was alone and standing on a stepladder when the accident occurred. He was working with his upper body above the suspended ceiling and his chest against metal water pipes, making him a good grounding path. The victim was electrocuted when he came into contact and stayed in contact with an energized 347-volt Bx12/2 wire. The wire had been removed from the fixture and left hanging at his side. WorkSafeNB determined the primary cause of the fatality to be working on a live fixture. Don’t take short cuts! Shorting-up the wires or turning the power off at the wall switch are not acceptable methods of de-energizing electrical equipment. The electrical breaker should be switched off and properly locked out and tagged before any work is accomplished.